MMM-Modulebar - A module that adds touch buttons for showing/hiding other modules. This Module adds a touch menu to hide / show other the defined (in the config.js) modules. This is my own mirrors view (Bottom Bar) using some addition in the custom.css see below. Here is my CSS settings for the module that I have added to my custom.css to give it the extra special look. 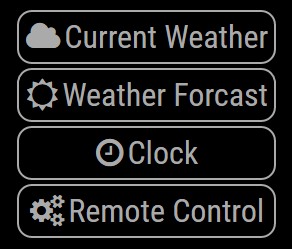 Had to change the button array format a bit. Make sure to update your config to the new “standard”. The reason for the change where to be able control each module separately even if it is the same module multiple times. @tosti007 Yes! That’s exactly what I wanted. I’m using your modules for accessing the “profiles” and my module as a “quick” option to just view one thing. Thank YOU, for making the first module. Is it possible to make the module bar itself toggle-able? It covers a large amount of screen real-estate; I was just wondering if its possible, how I could do that. @chaseb1357 Well, you could “hide” it with a button, but the problem is to get it back again. @Snille Haha, I tried that yes. only to realize my mistake. @chaseb1357 Personally I’m using the “Hide all” module for removing everything.